First, the recipe starts with ground turkey, so that makes it lighter to begin with:) Then I add a ton of veggies, remember, veggies are of course good for you, but they are super filling too!! I add celery, peppers (i used two colors of bell peppers) and saute those to start. Then after the chili is cooking for a while, I add zucchini and kale at the very end (it needs about 5 minutes to cook). My husband called this chili soup, because I didn’t cook it for very long only about 45 minutes. If you want a little thicker version, cook it as long as you like!! Just wait to add the soft veggies. 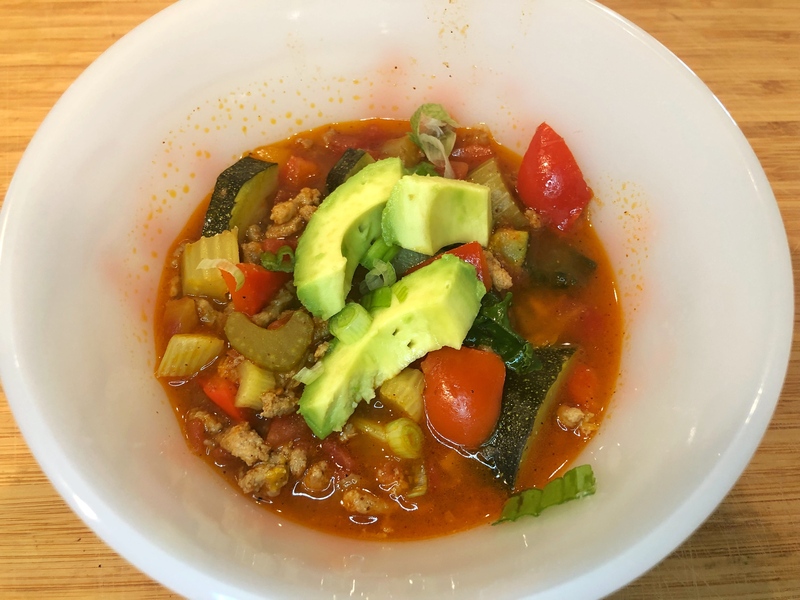 One other thing that could be added to make it a little richer is tomato paste, I would say anywhere from 2-6 Tbs worth of tomato paste would make this healthy chili have a deeper flavor. 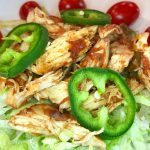 Feel free to spice up this recipe with a little cayenne spice or even add hot sauce to the finished chili. Also, other veggies you could add: jalapeños for some spice, carrots, green beans, mushrooms (they cook fast too, so add with the zucchini) or any squash. I used the veggies I had in my refrigerator. Here are the chili fixings I served the healthy turkey chili with, mostly because it’s what I had. I love adding the avocado for the creaminess, also a little cheese (I love cheese). 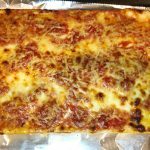 One of my kiddos added sour cream, which could be used or substitute plain greek yogurt. 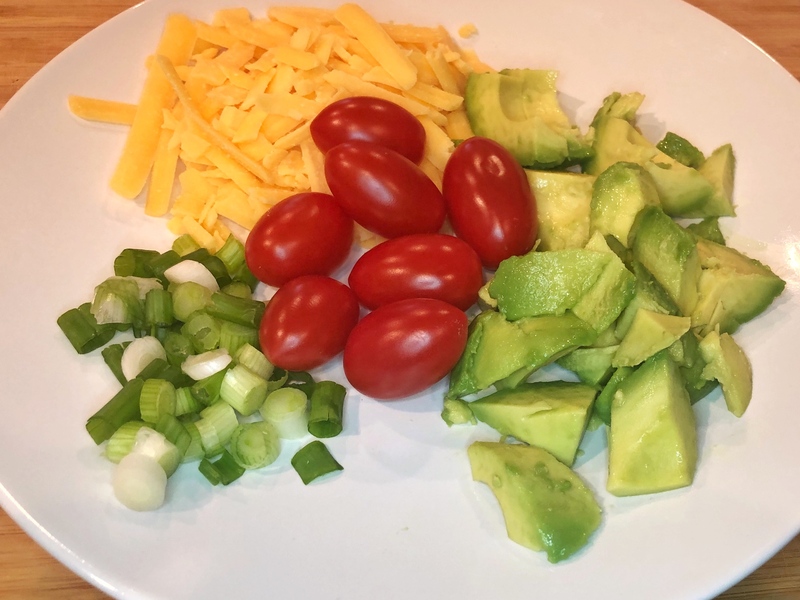 The fixings are endless, just choose fixings that are low carb!! 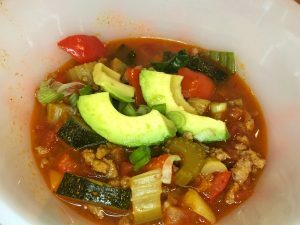 Healthy Turkey Chili Recipe perfect for the cooler weather, this recipe includes a ton of veggies to fill you up!! A perfect recipe chili for diabetics. Brown ground turkey with diced green onions. Feel free to use a real onion if you prefer. Start cooking the celery and peppers with 2 Tbs of avocado oil in a large pot. Once the ground turkey is browned, add to veggies in pot. Add broth to cover everything and cook for 30 minutes. Add zucchini and cover with broth. Cook for 10 minutes.